New, innovative wall-mounted washing line designs mean that you get maximum drying space with minimum fuss. For space-saving convenience it’s hard to beat a wall-mounted washing line, plus if you dry your clothes outside, they’ll smell fresher and you’ll save energy and money compared with tumble drying. Wall-mounted washing lines can be mounted inside or outside the home and once your washing is dry, the lines on many models can be folded away, freeing up space for more important things. With the Wallfix, Brabantia has given us a durable and very practical product. The Wallfix dryer fits into a compact space-saving unit that can be wall-mounted inside or out. The rotary construction means that despite its compact size you still get a full 24 metres of drying space, which is enough for at least one full load of washing, so it’s a good option as an alternative to a single horizontal washing line if you have a small garden or limited space. Instructions for mounting the unit are written on the box, so make sure you don’t throw the packaging away too eagerly. Instructions are clear and easy to follow and the kit even includes a template for drilling the holes and a special spanner, which is a great time-saver for busy DIYers. The washing line is simple to operate and can be opened out from the wall with one hand, which is handy when you head out into the garden with a bundle of washing under one arm. When not in use, it’s equally easy to collapse neatly out of the way, and the supplied cover keeps the Wallfix clean, dry and tidy. The outer lines are 120cm in length – wide enough for single sheets but doubles and duvet covers will need to be folded once, or pulled over a corner, but the lines are well spaced allowing good air circulation between your clothes, reducing drying time. A robust design, enough drying space for a full load, easy to use and install, and the 5-year guarantee brings peace of mind. The Brabantia Wallfix retails around £70, which despite this washing line’s solid build quality we find a bit pricey. It doesn’t rotate, so washing on the inner lines nearest the wall can take longer to dry. Already popular in Australia and the USA, the Hills Supa Fold Duo has recently been released in the UK. We love the flexibility of this washing line, it really is a ‘use anywhere’ solution. Indoors, outdoors, on a balcony, along a corridor, above a utility room worktop, between fence posts, on stud walls or brick walls, the Supa Fold Duo can turn any space into drying space. The brackets are mounted independently of the lines, which means the washing line can be completely removed in seconds, or the lines can be simply folded against the wall. The dual frame gives you the flexibility to use the small frame for small loads, or both frames for large loads. The 23 metres of line space mean you can easily dry a full family load of washing. As with the Brabantia, the lines are well spaced allowing good air circulation between your clothes, reducing drying time, but because of the horizontal design there’s no problem drying large sheets. A unique design, flexible enough for use anywhere around the home, enough drying space for a full load, easy to install and remove, it’s an excellent choice if you want to make the most of the space around your home and garden. We’re great ambassadors for the German designed Leifheit Teleclip; we have a small utility room and this washing line suits our needs perfectly. It is stable and compact and fits neatly above our washing machine and is great for drying smaller items like socks and underwear, but is sturdy enough for wet towels. It is weatherproof, so can just as easily be fitted to an outside wall or balcony. The simple concertina design makes opening and closing the washing line a cinch – simply grip the handles at the side of the dryer and gently pull to open. The dryer extends out smoothly and the drying rails are ready for use. When the washing is dry, just push the two handles back towards the wall and the washing line conveniently folds up to the depth of a radiator. The drying rails are made from plastic coated steel so they’re nice and sturdy. Mounting the washing line is straightforward; the wall fixings are good quality steel and Leifheit supply screws and standard wall plugs for mounting. However, please keep in mind that some walls such as cavity walls may require special fittings. Durable construction and easy to use, this wall-mounted washing line is ideal solution for anyone needing some extra drying space. If you’re paying the full RRP, it can seem a bit expensive. Some lateral movement when fully extended gives the impression it could be damaged if knocked. 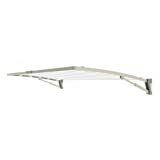 This South African-made folding frame washing line is ideal for narrow passage ways or anywhere where there is only a small amount of space between the wall and an obstruction. It easily folds and unfolds and with the line-tensioning device, you’ll never have a problem with the lines becoming slack over time. The solid build galvanised steel frame is powder coated to provide a long-lasting painted finish, and you get the impression from the minute you open the box that you have purchased a quality product that will last the test of time, a sentiment which is backed up by Retractaline’s 10 year guarantee. 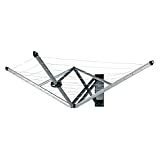 This washing line does what it says on the tin, very well, and if you need more drying space, the Retractaline also comes in a single frame version. The Retractaline clothesline lacks some of the versatility of the Hills. Once it’s mounted on the wall, it’s there to stay. You can purchase a ground-mounting kit to turn it into a free-standing washing line, but that will cost you an additional £50.